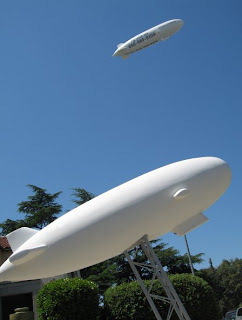 I've been waiting for this shot of 'Eureka' lined up with our model Zeppelin for a while! It was taken during a photoshoot we were doing on the Zeppelin yesterday to create some 360 degree views of the interior and exterior for the website. Thanks Angela! I just want to say that I really enjoy reading this blog. My grandfather worked at Moffett Field before I was born, and I've always loved it there. I will have to find a way to take my dad on an airship ride. Do you guys still use Twitter?